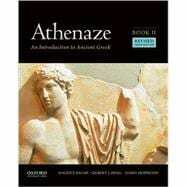 Since its publication in 1990, Athenaze: An Introduction to Ancient Greek has helped tens of thousands of students learn classical Greek. Building on the bestselling tradition of previous editions, the long-awaited third edition combines the best features of traditional and modern teaching methods. It provides a unique course of instruction that allows students to read connected Greek narrative right from the beginning and guides them to the point where they can begin reading complete classical texts. James Morwood, editor of the Oxford Grammar of Classical Greek and the Pocket Oxford Classical Greek Dictionary, brings his expertise and years of teaching experience to this revision. Carefully designed to hold students' interest, the course begins in Book I with a fictional narrative about an Attic farmer's family placed in a precise historical context (432-431 B.C.). This narrative, interwoven with tales from mythology and the Persian Wars, gradually gives way in Book II to adapted passages from Thucydides, Plato, and Herodotus and ultimately to excerpts of the original Greek of Bacchylides, Thucydides, and Aristophanes' Acharnians. Essays on relevant aspects of ancient Greek culture and history are also woven throughout. Maurice Balme was former Head of Classics at Harrow School, UK. Gilbert Lawall is Emeritus Professor of Classics, University of Massachusetts, Amherst.